THE GODFORSAKEN DAUGHTER by Christina McKenna & A GIVEAWAY! In the very early 80s, my father married an Irish woman with six kids. She was seriously Irish, first generation from Athenry, County Galway. When they moved in, almost everything was replaced in the color green, Mondays were corned beef and cabbage and all they, and soon we, talked about were The Troubles. Picking up Christina McKenna’s, THE GODFORSAKEN DAUGHTER got my Irish up a bit. I remember learning to make traditional Irish soda bread, attempting to cross stitch and throwing up after sneaking Irish whiskey, which I was much too young to drink. Back to 2015, I don’t know about you, but Monday, I had a lovely St. Patrick’s Day! THE GODFORSAKEN DAUGHTER is set in the 1980s Ireland. Ruby Clare loves her father and looks forward to working with him out in the farm fields every day. But he dies, leaving behind the 63-acre farm, Ruby, her mother and nasty twin sisters. First thing her mother does is forbid Ruby to work outside on the farm and turns her into her private servant. Her sisters live in Belfast but come home to Tailorstown on weekends to add a special sisterly brand of torture to Ruby’s already dismal existence. The only bit of joy she has is in the form of Jamie McCloone, a lonely bachelor farmer she knows. Dr. Henry Shelvin is a psychiatrist in Belfast. His wife, Constance goes missing one night and he proceeds to spend all his time looking for her. It’s destroying him, but this is also a time of unrest in Belfast. There’s a civil war waging between the Protestant IRA and the Catholics and he is told to “lay low” to stop looking for her, but nothing more. He leaves Belfast for Tailorstown and finds peace working with small town patients while never losing hope he’ll find his wife. The two stories come together in a somewhat awkward way. In some ways, they seemed as if they were two different novels. As I was reading, I found myself invested in Ruby’s story that I couldn’t stop until the end and was satisfied with the resolution of how everything turned out. THE GODFORSAKEN DAUGHTER somehow feels like a step back in time, with McKenna’s lyrical portraits of the countryside. It’s a story of family, love and faith. This is the third novel in Christina McKenna’s, Tailorstown Series. 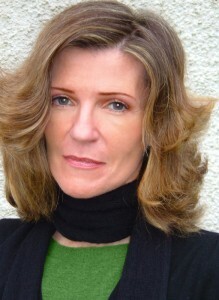 Christina McKenna grew up on a farm near the village of Draperstown in Northern Ireland. She attended the Belfast College of Art, where she obtained an honors degree in fine art and studied English in postgraduate studies at the University of Ulster. In 1986, she left Northern Ireland to work abroad. She has lived, worked, and painted pictures in Spain, Turkey, Italy, Ecuador, and Mexico. 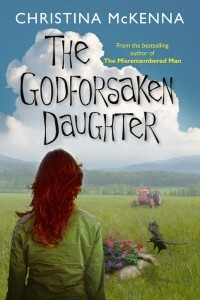 Thanks to TLC Book Tours for providing a copy of THE GODFORSAKEN DAUGHTER for an honest review. Check out http://www.christina-mckenna.com for all things CHRISTINA. We’re giving away a copy of THE GODFORSAKEN DAUGHTER. Just leave a comment on this blog. Staying in the spirit of the “Luck of the Irish,” do you have anything that you consider lucky? For instance, I was given a Montblanc pen the first time I anchored the news and I always used it. We’ll pick a winner Tuesday! Good Luck! This novel sounds captivating and interesting since I am interested in the lives of the characters, the locale and the era. Thanks for this great review, feature and giveaway. I have a bit of Irish in me. My grandmother’s family came from Ireland. The Jaggers. I don’t have any special trinkets that I consider lucky. This novel sounds like a cross of a contemporary “realistic” Cinderella story with a crime thriller. The setting in Ireland in the 1980’s coupled with the write’s ability to weave both stories together is intriguing.